Anterolateral leg alopecia also called peroneal alopecia is a common form of hair loss seen in adults in clinical practice but less commonly described in literature. Anterolateral leg alopecia presents as symmetrical, sharply demarcated, and circumscribed hair loss on the anterior and lateral aspect of lower legs. Literature review has shown that the prevalence of anterolateral leg alopecia among males is 35%. We describe a 43-year-old male patient with anterolateral leg alopecia associated with chronic urticaria and hypothyroidism. 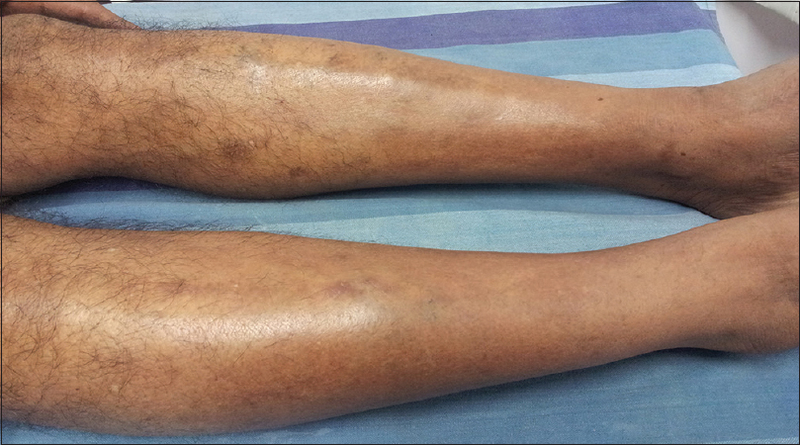 A 43-year-old healthy male presented with loss of hair on both lower legs noticed from 3 months duration. There was no history of trauma or any skin lesions prior to the onset of hair loss. He was a known case of chronic urticaria from the past 1 year on treatment with levocetirizine on and off. Family and personal history were noncontributory. General physical examination was normal. Cutaneous examination revealed well-defined circumscribed nonscarring alopecia on the distal lower anterolateral area of both the lower legs [Figure 1]. Mild varicosities were present on the upper one-third of lower limbs. Peripheral pulses were normal. Scalp hair was normal. Routine hematological investigations and serum chemistry profile were normal. Thyroid tests revealed increased thyroid stimulating hormone (11.6 mcIU/ml) with normal T3 and T4 indicating subclinical hypothyroidism. Doppler ultrasound of the both lower limbs was normal. Skin biopsy from the alopecia patch showed normal epidermis, absent hair follicles with perivascular lymphocytic infiltrate in the dermis [Figure 2]. Based on the above findings, a diagnosis of anterolateral leg alopecia was considered. Anterolateral leg alopecia wasfirst described in 1920. It is also called as peroneal alopecia as it is distributed along the peroneal nerve. The exact etiopathogenesis is not known. However, various hypotheses suggested are leg crossing, trouser-rubbing, friction, and association with androgenetic alopecia. Some authors have shown that it is not associated with friction as it produces truncated hairs and follicular hyperkeratosis. Hamilton showed no statistically significant association between androgenetic alopecia and alopecia of lower extremities although both forms can be present together. Peripheral nerve disease and thyroid abnormalities have been suggested as possible etiology. 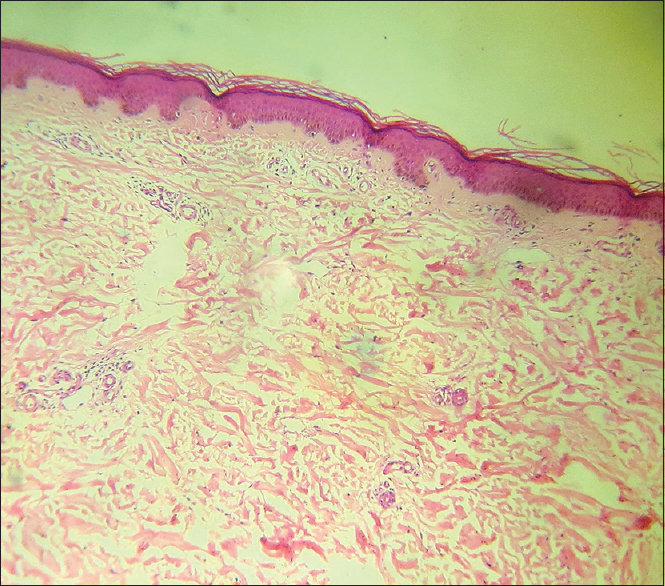 Histopathology of anterolateral leg alopecia has shown normal epidermis with absent hair follicles. The most common differential diagnosis to be considered is alopecia areata which can be distinguished by histopathology. The use of a dermascope may be worthwhile as a noninvasive diagnostic modality to differentiate from alopecia areata. The course of the condition is benign, with spontaneous resolution. Treatment of this condition is not described in literature. Counseling forms the mainstay of management. Although anterolateral leg alopecia is a common condition seen in adults, less information is available regarding this entity about etiopathogenesis and management. The condition may be underreported because of its benign nature. In our case, there could be possible association with thyroid dysfunction and chronic urticaria, also raising the probability of autoimmune etiology. Anterolateral leg alopecia should be thoroughly investigated for underlying etiology, and more cases should be documented in literature. Ronchese F, Chase RR. Patterned alopecia about the calves and its apparent lack of significance. Arch Dermatol Syphilol 1939;40:416-21. Gupta SN, Shaw JC. Anterolateral leg alopecia revisited. Cutis 2002;70:215-6. Danfort CH. Studies on hair, with special reference to hypotrichosis, IV: Regional characteristics of human hair. Arch Dermatol Syphilol 1925;12:76. Siah TW, Harries MJ. Anterolateral leg alopecia: Common but commonly ignored. Int J Trichology 2014;6:75-6. Hamilton JB. Patterned loss of hair in man; types and incidence. Ann N Y Acad Sci 1951;53:708-28.